Trump Gives Mattis Authority To Set U.S. Troop Levels In Afghanistan : The Two-Way It's not immediately clear how the decision will impact force levels. Defense Secretary Mattis was blunt when he spoke to Congress on Tuesday: "We are not winning in Afghanistan right now." 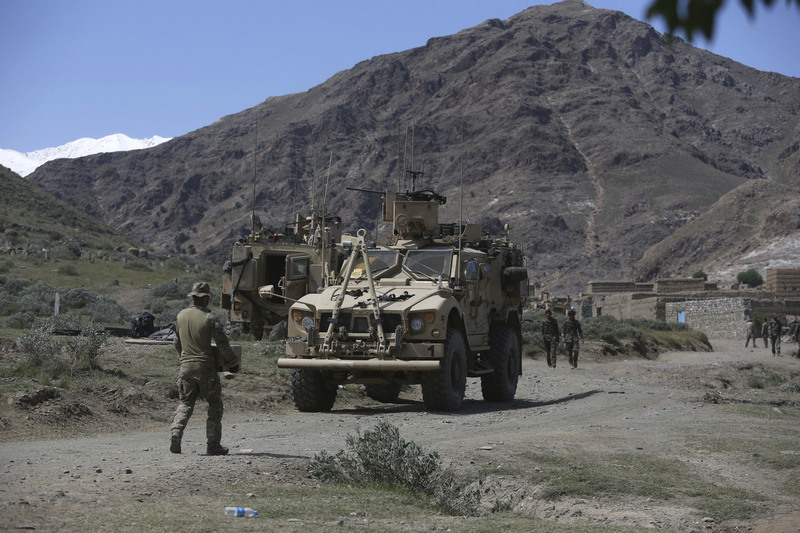 U.S. forces and Afghan commandos in April in Asad Khil village, east of Kabul, Afghanistan. President Trump has given Defense Secretary Jim Mattis the authority to set U.S. troop levels in Afghanistan, a U.S. official tells NPR's Tom Bowman. Mattis was blunt when he spoke to Congress on Tuesday: "We are not winning in Afghanistan right now, and we will correct this as soon as possible." It's not immediately clear how the decision will impact force levels, and the White House and the Pentagon have not officially commented on the policy. The move is a "very sharp departure from Obama," Tom says. But the White House "already has given Mattis similar authority to beef up troop levels for the anti-ISIS fight in Iraq and Syria," he adds. The top U.S. commander in Afghanistan told Congress in February that thousands more troops would be needed to break out of the current "stalemate." The Trump administration is in the process of reviewing U.S. policy toward Afghanistan, and Mattis said today that a new strategy would be released by mid-July. Tom told Morning Edition earlier this month that the White House held a meeting less than two weeks ago about the issue and "there's been no decision yet by the White House or even by Defense Secretary Jim Mattis, who's asking a lot more questions about this." This week, the White House held another meeting on Afghanistan. An increase would likely involve forces primarily in a "training and advising role," Tom added.